Emporio Armani Diamonds Intense is more enticing than ever. This surprising gourmand floral fragrance based on the traditional symbol of femininity, the rose, is harmoniously composed with luscious, edible notes to create an especially desirable combination. Discover this scent's new, bold rhythm that will capture your body and soul. Diamonds Intense is one of the best parfume in the whole world.You will love it more and more every day when you`ll try it. 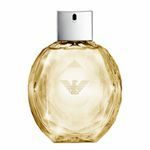 Unforgetable expirience for me,gorgious smell.Every woman can just ask for more bottles.I think for me will never be enough of this cristal glamurous fragrance even someone give to me a cistern of this parfume.I am recommanding to every classy woman.Thank you G.Armani.